Uses one lead in the right atrium, and the other in the right ventricle. In AV sequential pacing, pacemaker spikes will occur both before the P wave and the QRS complex. However, no pacemaker spike will occur before the P-wave, if the native atrial rate is faster than the programmed lower rate of the pacemaker. There is either a paced or native QRS depending upon the pacemaker’s programming and AV conduction. 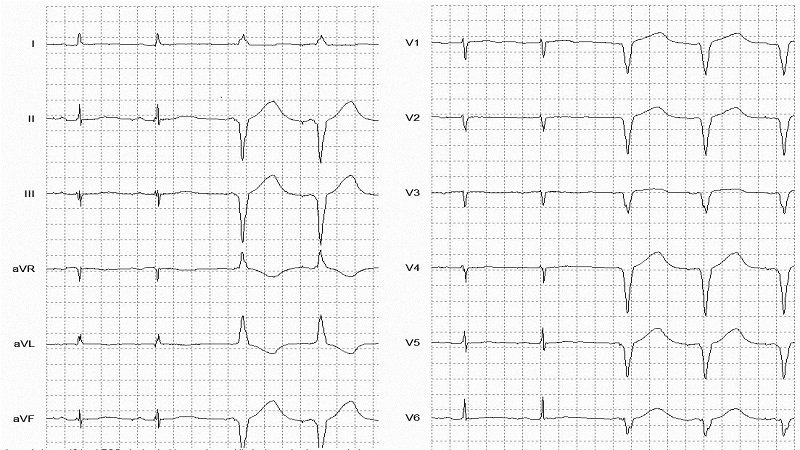 If paced, the QRS has a left bundle branch block (LBBB) morphology. If there is a native ventricular depolarization, the QRS morphology is normal (unless a native bundle branch block is present).